There are natural pearls and cultured pearls. 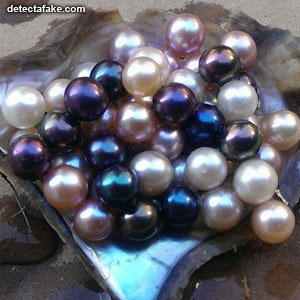 Real pearls may come from freshwater or saltwater and from a variety of molluscs (not just oysters). 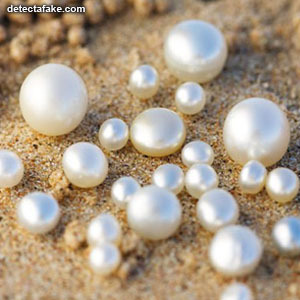 The finest quality natural pearls have been highly valued as gemstones and objects of beauty for many centuries, and because of this, the word pearl has become a metaphor for something very rare, fine, admirable, and valuable. 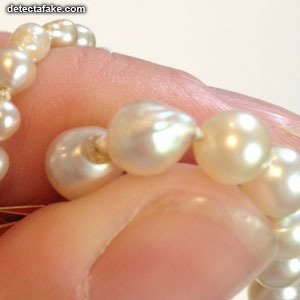 Follow the tests below to determine if your pearls are real or fake. 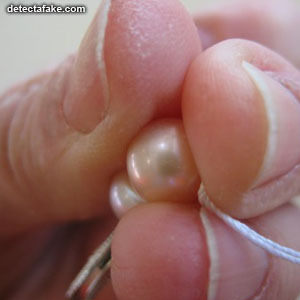 The first thing to look for when trying to determine the authenticity of a pearl is the shape. Pearls are not man made so they should not be exactly round. If the pearls you have are individuals, roll them across a surface. If they roll smoothly (like a marble), they are probably fake. If they roll and change directions and are erratic in speed, they could be real. If they are with others, such as a necklace, look at the shape. You should be able to see that the shape is less than perfect. Also, the sizes should not be the same between the pearls. Next, place the pearl(s) up to your teeth. Gently rub them back and forth. If they are real, you should feel a gritty vibration against your teeth. If they feel smooth, they're probably fake. The next test is similar to the test above but instead of using your teeth, rub them against each other. If they are real, they should feel gritty when they are rubbed together. If they feel smooth, they're probably fake. Next, try the sun test. Take the pearls into direct sunlight. In natural sunlight, you will be able to see variations of color that shift as you move. If you see that, they could be real. Now, try the temperature test. Real pearls are cold to touch for the first couple of seconds before warming up against your skin. 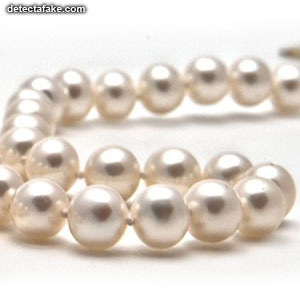 Fake plastic pearls have the same temperature as the room temperature and you don’t feel the coolness when you touch them. However, fake ones that are made of glass beads can be cool to touch to start with. But it tends to take them longer to warm up against your skin than real pearls.